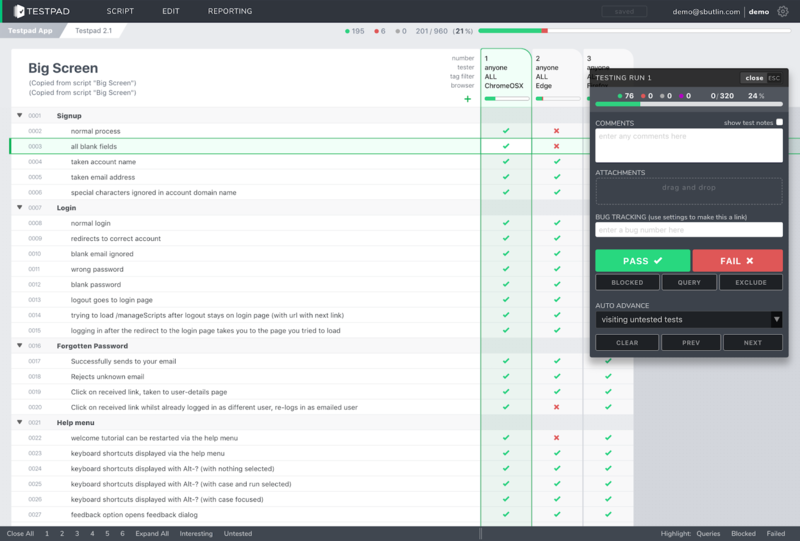 The quickest way to get up and running with Testpad is to import existing tests, but the simplicity of doing this depends on the current formatting and layout of your tests, especially when you're copy/pasting from spreadsheets. Read on for details of how this works, or simply skip ahead and take a close look at these Spreadsheet Import Examples. This article concentrates on importing test cases from spreadsheets, but it should still be relevant to importing any source of table data into Testpad, including User Scenarios, Feature Definitions, or even existing checklists. But if you're starting from scratch, writing new tests in your own style, then you don't need the help in here - instead, just get on with writing simple prompts of things you want to remember to test and go from there! 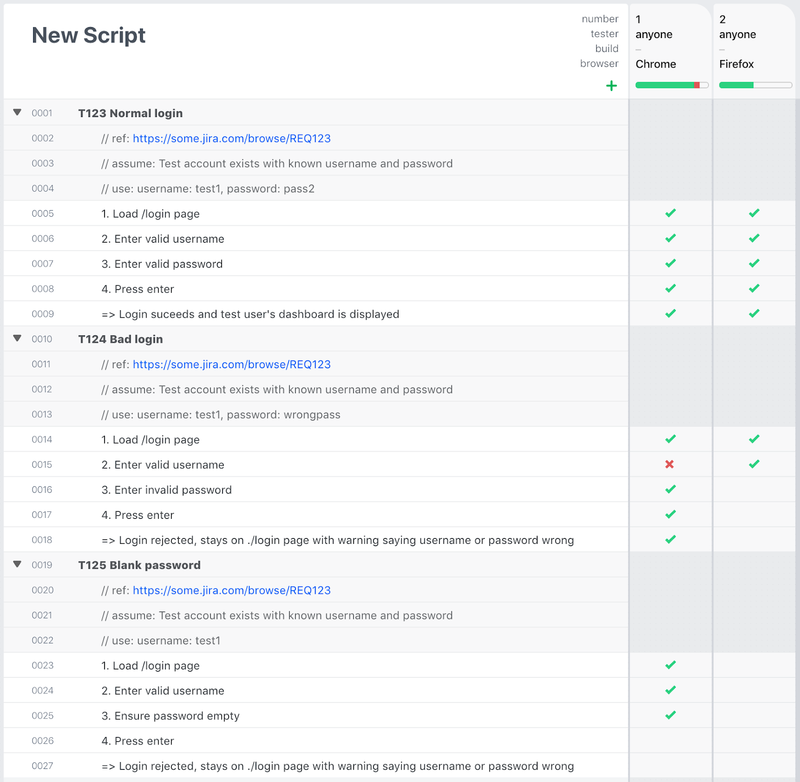 Testpad's main document is a Script, and importing happens a Script at a time. Make a new empty Script and look to the Edit Menu -> Import option to open the Import Dialog. Copy/paste your text for import, select a format option, and hit the Import button. Any leading spaces or tabs (i.e. indented) rows will be spotted and used to form title rows with blocks of (indented) content underneath. At a higher level, this is ideal for grouping tests by topic. At a lower level, it's ideal for grouping rows to describe richer test cases - more of which later. If you copy/paste from a spreadsheet, the format is typically quoted (to encapsulate cells, especially when multiline) with cells separated by Tabs. The Import Dialog can deal with the quoted cells, but you need to specify the Spreadsheets formatting option. If you try to import a copy/paste from a spreadsheet using the Plain text format setting, the " quote characters won't be removed, and you're likely to get a bizarre looking layout. When copy/pasting from a spreadsheet, you need to start by only copying a single column. 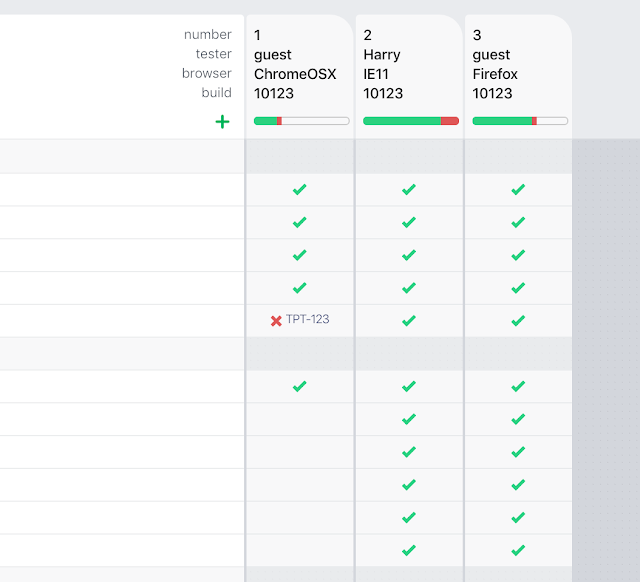 Tests in Testpad are essentially a single column of test descriptions, with only results (not additional test data) appearing in multiple columns. So what about when your spreadsheet of tests, like most test plans, has tests defined in rows across multiple columns? Maybe you've got one column for the title, another for the Steps of the test, and yet another for the Expected Results. How do you import two or three columns into Testpad's one column? Well... the answer is that you don't! Instead, you need to play with your spreadsheet a bit to build a new (single) column that is some aggregation of the other columns. 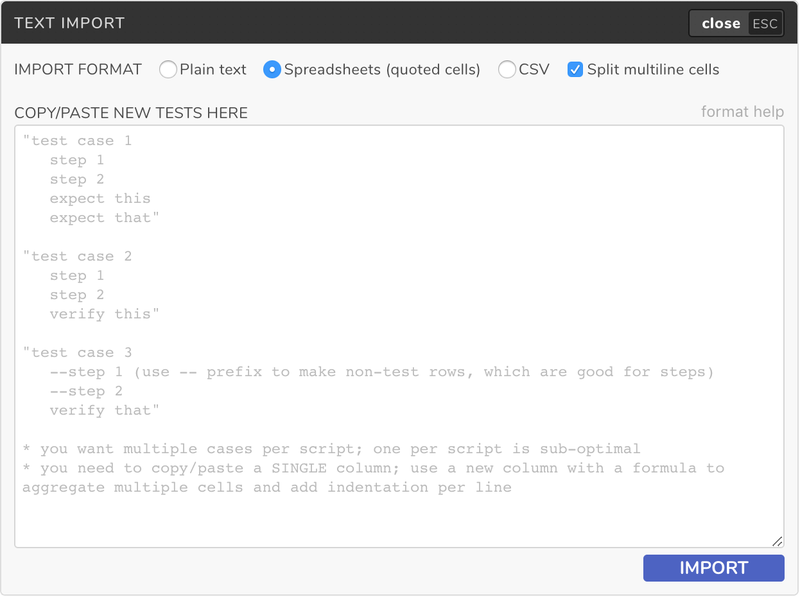 This is best done by creating a new column, and starting in the first row, start building up a formula that will put together the other cells into a "Testpad-friendly" single cell. 4. 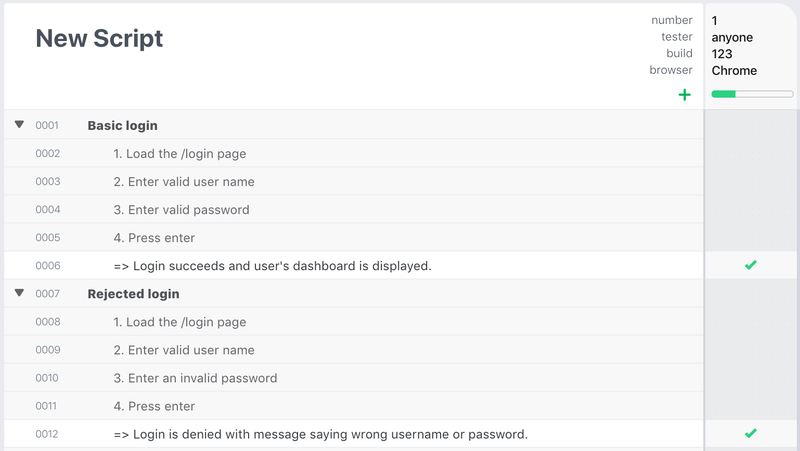 Press enter Login succeeds and user's dashboard is displayed. 4. Press enter Login is denied with message saying wrong username or password. 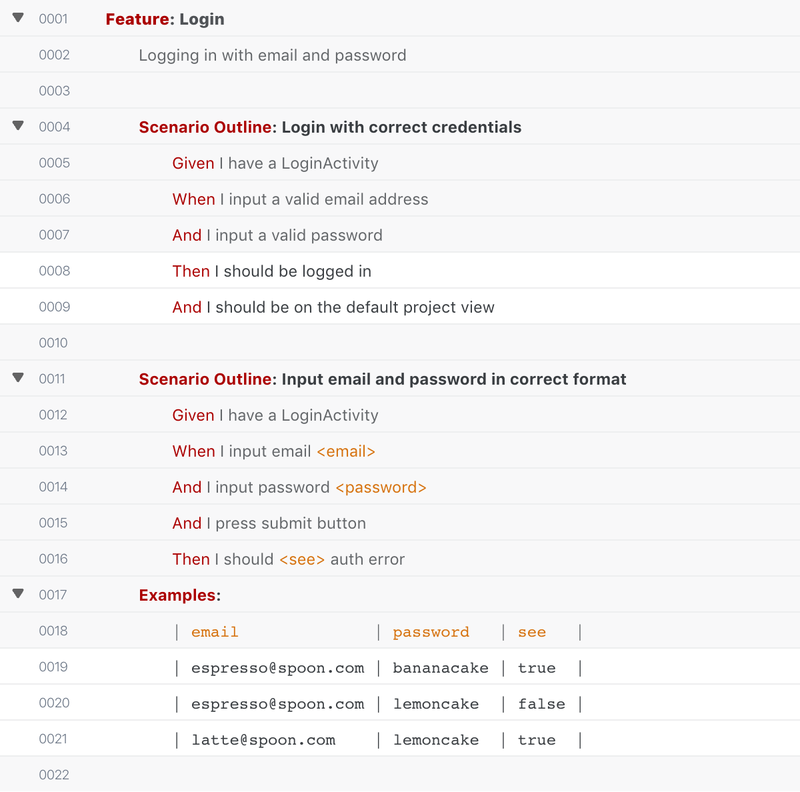 Login succeeds and user's dashboard is displayed. Login is denied with message saying wrong username or password. But we can do a bit better if we add in some indentation to better structure the new test column. 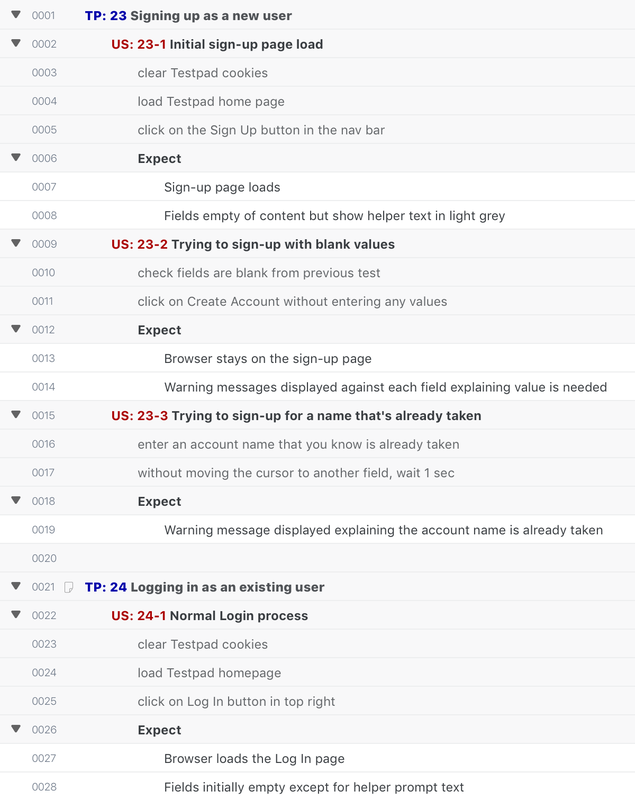 => Login succeeds and user's dashboard is displayed. => Login is denied with message saying wrong username or password. This latest version of the formula also inserts some "--" prefixes which Testpad interprets as "comment" (i,e. non-test) rows. Whether you want to use comment rows depends on whether you mind collecting results for "steps". My own preference is it's fine, when I record a "pass" against a step, I'm recording a result to the effect "yes, did that, no problems". But lots of people like to make steps just comments and only record results against the Expected Outcomes. How did that work?... check out the collection of Spreadsheet Import Examples for more detail. These examples all illustrate multiple test cases per import - it's a common misuse of Testpad to only have one test case per script - you definitely want to put multiple test cases into each script, making good use of the indentation structure to form logical groups. Testpad will actually accept two or three column imports, but it uses them for it's own purposes... if present, Column 2 will define the Tags to include for a tow, and Column 3 will define Notes. 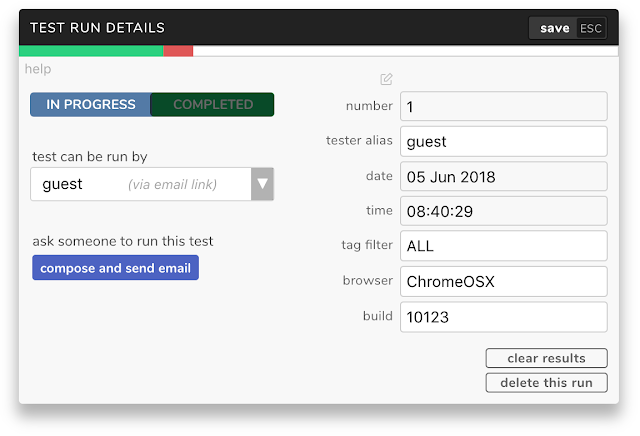 Tags are part of Testpad's tags and filtering feature, where test rows can be tagged with labels that Test Runs can filter for - useful for defining subsets of tests for certain test run conditions. And Notes are for the notes field that is "behind" every test row, displayed in the Test Details dialog. You can access the Test Details dialog by clicking on the small doc icon, or double-clicking the row ID, or typing Alt-N. These Notes are wiki-formatted and can be displayed during testing if required using the little checkbox in the Test Run execution dialog. The Notes field (third column in multi-column imports) is another option for where to put imported test content. 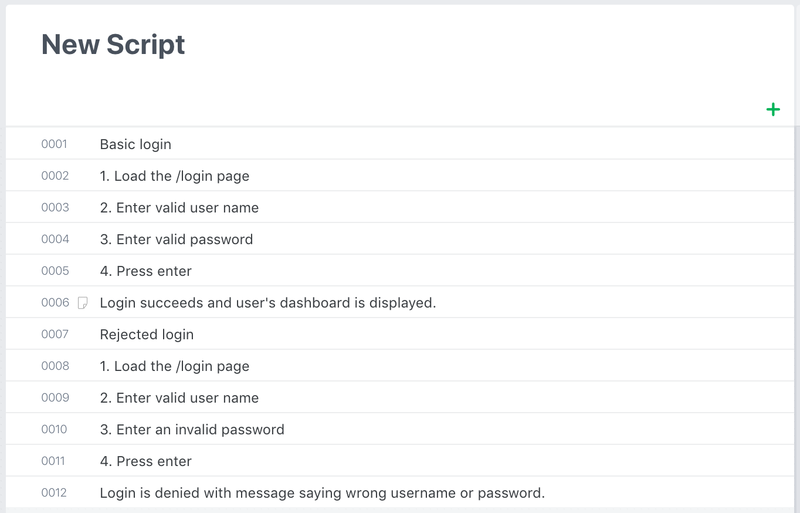 For example, if most of your testers are familiar with the product, then you might want to "hide" the Steps in the Notes field and only display the things to Verify in the main part of the Script. 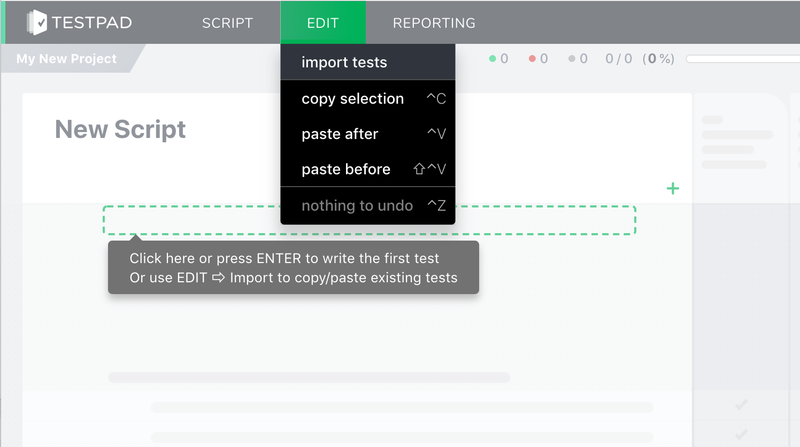 New or less experienced testers can then open the Details dialog to get the extra instruction when needed, but for everyone else, the Script is more compact and can be read through and executed more quickly. To populate the Notes field during an import then, you need your copy/paste to span three columns, where the first column will be the main test text, the middle column empty (assuming you're not trying to tag anything yet), and the third column for the notes. This is all best achieved by adding three new columns to your spreadsheet, and setting up formulas to aggregate/copy the relevant cells into the first and third of the new columns. Again, have a look at the Spreadsheet Import Examples for an example of a multi-column import. And lastly, a note on CSV imports. These work exactly the same as spreadsheet imports, except that the cells are separated by commas instead of tabs. Just as for copying from spreadsheets, you need the first column to be the main test text as described (at length!) 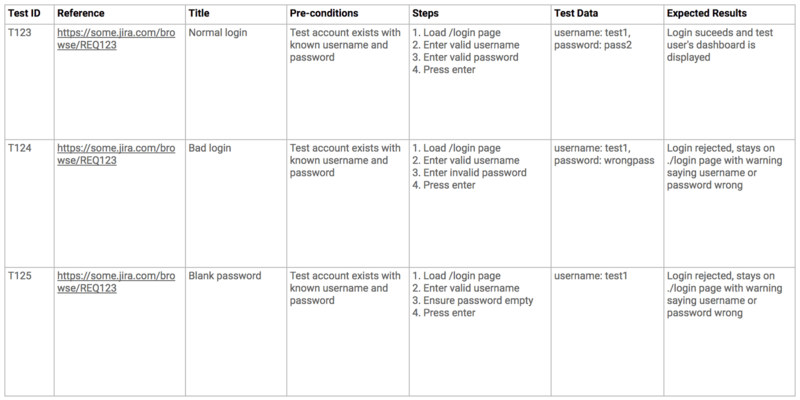 above, the second column for tags, and the third column for each test's Notes field. If this is all still not making sense, or you have existing tests that you'd like some help with how to import, then don't hesitate to email some example tests and questions to support@ontestpad.com - always very happy to help. 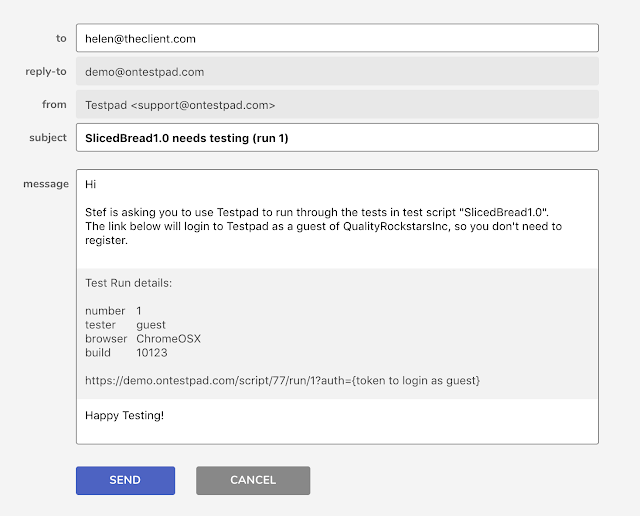 This post documents the several simple and flexible methods that Testpad has for including links to third-party content. It's very common when writing tests to want to associate the tests with why they exist. 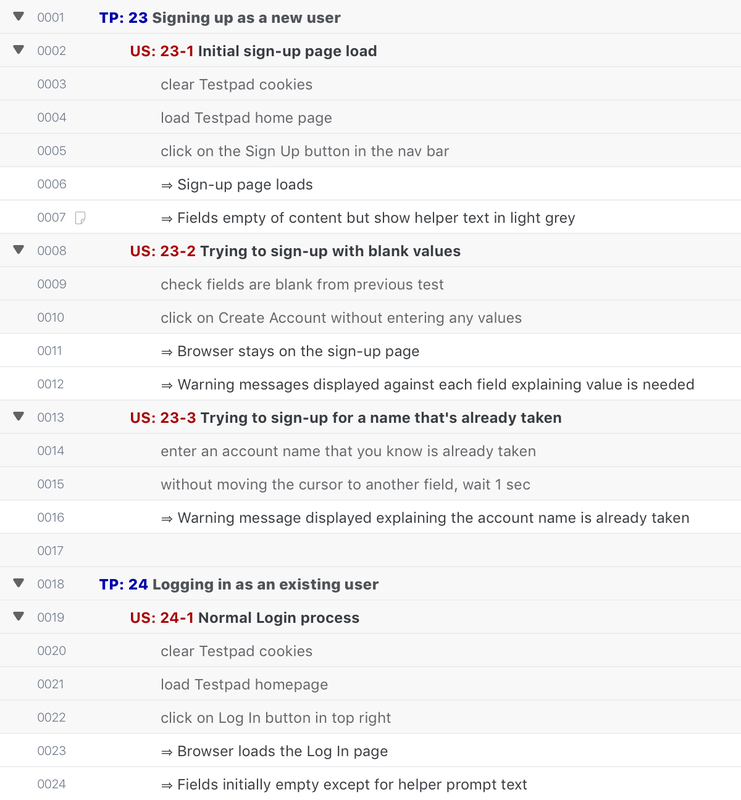 This usually means linking the test in some fashion to the User Story (or feature spec, or requirement definition etc) that scopes what the tests need to check is working. In other scenarios, it's common to want to provide the tester with additional resources in the form of links to help documentation, or other further context on the where/why/what of the topics under test. As usual, Testpad doesn't try to be complicated with making such connections to third-party material. Instead offering a variety of methods for including clickable links that simply load up the referenced page in a new tab... basically what the hypertext in http means! Whenever you include an obvious link (starting http:// or https://) in some text, Testpad will recognise it as a link and display it as a clickable link opening in a new tab. If the link isn't too long or complicated looking, this method is basically just for free and happens without even reading up on the details! If you go to Project Settings for your project, you can enable Markdown-style Links (they're off by default), which means any time you include a link with the pattern [Title](link), the "link" will be displayed as the clickable "Title". Useful for longer/complex URLs that otherwise confuse the text they're appearing in. Similarly, in Project Settings, you can alternatively enable Wiki-style Links, so that any time you include a link with the pattern [[ link | Title ]], the "link" will be displayed as the clickable "Title". Lastly, and perhaps most powerfully, Testpad includes a link pattern generator which is great for when you want to include lots of links to very similar URLs. 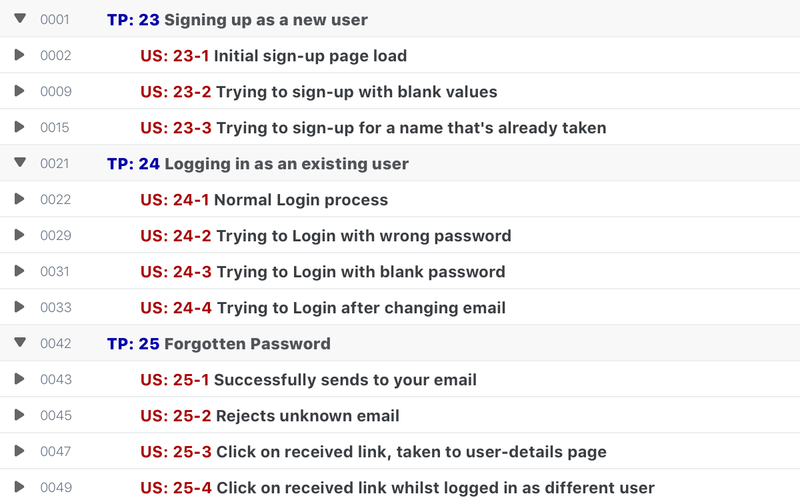 For example, if every test block needs to link to the User Story item in JIRA that it pertains to, it would be tedious to include the full JIRA path in every test title. is defining a short-code "story", such that whenever some text includes "story:ABC123" (i.e. "story" followed by a colon followed by some characters), the short-code will be replaced with a link to "https://some.website/issue/ABC123" that's displayed as User Story ABC123. 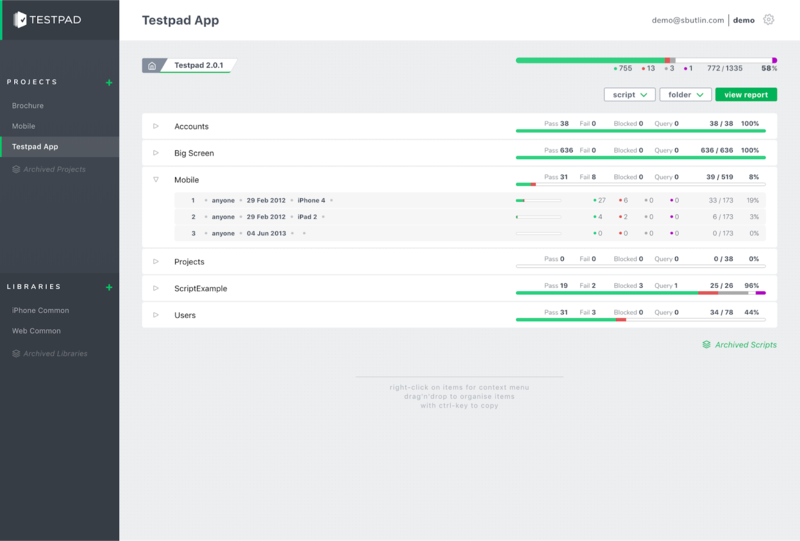 Testpad has a very flexible model for writing test plans (Scripts) which lends itself to pretty much however you want to approach and organise your testing. However, with this flexibility comes the power to go a bit wrong too.. it's perfectly possible to build inefficient plans and lose out on a lot of the value Testpad has to offer! 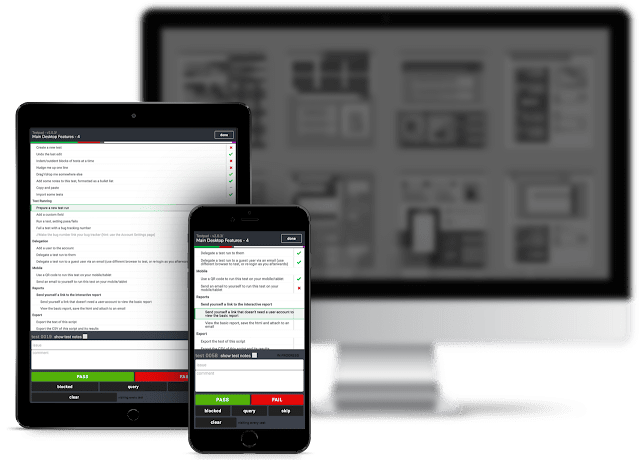 This post then is the first in a series of three providing tips on getting the most from Testpad. 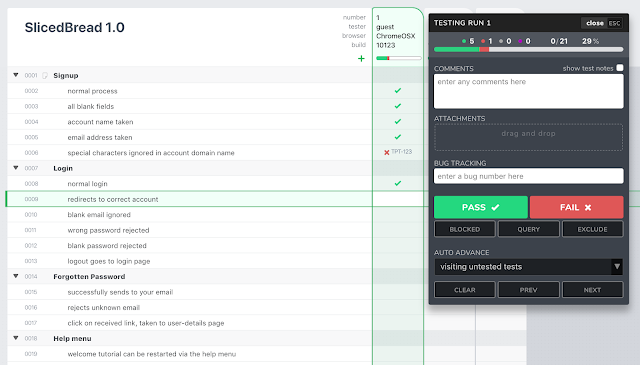 In time, Testpad's interface will itself be improved to nudge users in these "more optimal" directions, but until then, here are some hints for great usage patterns. These tips also have a side-benefit of keeping content to a sensible size, both for manageability by the user and in terms of browser performance rendering the content on the screen. However, that said, you have to build an enormous script (think 1000+ rows with 100+ columns) before browser lag becomes annoying. First up is the idea of "retesting" test runs (columns). 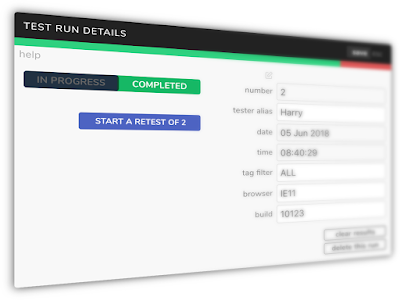 When a Test Run in Testpad is completed, whether marked as such manually in the Test Run Details dialog, or through setting results for every test, the Test Run Details dialog offers the "Start a Retest" button. Retests are intended for retesting e.g. a new build. You've run through your tests a first time and found a number of test fails. The developers have fixed these and issued a new build that needs another test. So you come back to Testpad to make another run through your tests. The thing not to do at this point is click on "New Test Run" to make a new column, additional to the columns already present. This is the path to the dark side and will lead to an ever accumulating number of columns, eventually slowing down the browser's responsiveness as you get north of 100 columns (sooner if you have >1000 rows). 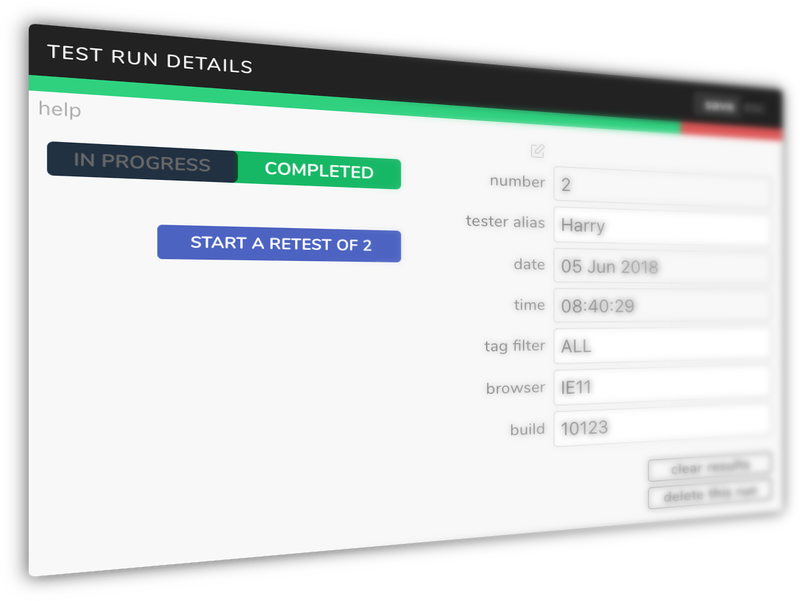 Instead, you want to be using the "Start a Retest" button, offered in the Test Run Details dialog for runs marked Completed. A Retest makes a new column that takes the place of the old column. To start with, the old column is displayed beside it, but greyed out. After a page reload, or when you next return to the script, the old column is not displayed at all. (You can get old columns back on screen with a right-click on the run header, selecting "Show Old Runs"). Retests are numbered like version numbers. Test Run 1.1 is the first retest of Test Run 1. Test Run 2.4 is the fourth retest of Test Run 2, and so on. You can optionally inherit the results from last time. Inherited results are shown slightly lighter than new results and are there if you want to e.g. only retest the problems from last time. A Retest also takes over the contribution to the progress statistics for the script. If you keep making new test runs (the bad way! ), the progress statistics are always the sum of all runs ever conducted, and so can never approach a 100% pass rate with successive new builds. But use retests, and each retest can iterate the results for that run and allow them to reach 100% when everything is passing. That's it for tip #1. 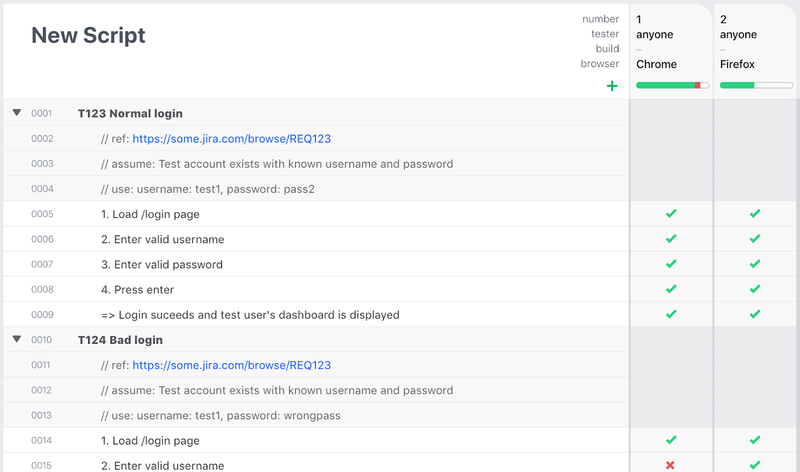 Use the Retest feature when retesting new builds and don't keep making more and more columns, stretching the page off to the right. Any questions, please email stef@ontestpad.com - always keen to help you get the most out of Testpad.